What is Allergic Diagnostic Market? Allergen diagnostics is identifying the allergy and preventing or curing the allergy at the different stages. Allergic diagnosis is segmented based on the different types i.e. from type I to type V. Type I allergy are those which take place primarily on epithelial surfaces which are skin, lungs, gastro intestinal track. Type IV are cellular reactions which involve T lymphocytes. The granulomatous type V allergy can be regarded as a variant of type IV allergy, as it also triggers a cell-mediated immune reaction, but involves macrophages instead of T lymphocytes. 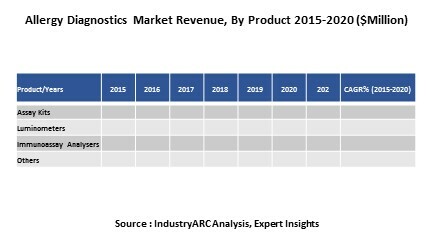 What are the major applications for Allergic Diagnostic Market? The various end users assessed includes hospitals, diagnostic laboratories and other research laboratories. Patch test is the new method which is used to identify the skin allergies. This patch is attached to the patient’s body for 48 hours. The patches record the information as negative, irritant reaction, uncertain depending upon the type of allergy. For the people who are allergic to tablets companies are manufacturing the immunotherapy drops of allergen extracts drops. These drops are taken under the tongue for 3 times a day. By using this immunotherapy drops, the resistance power of a person will be increased and in no time the person body becomes tolerant to allergen. Who are the Major Players in Allergic Diagnostic Market?